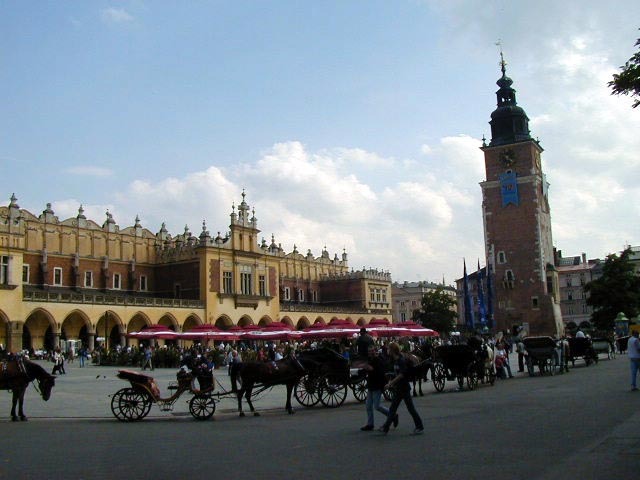 Krakow is a beautiful historic city. The one downside is accommodations--a cheap room can be hard to find during the summer. I was able to get a room in a student dormitory, renamed Hotel Letni during the summer when it is open for tourists. It was about a mile south of Old Town and cost 47 Zt, about $12. I only visited one museum of note--the Czartoryski Museum. What made it memorable were the fragments of the ancient Egyptian Book of the Dead, translated into English and Polish. I didn't know any of this book still existed. It had prayers used in the Pharonic religion that were similar to prayers used in current religions. Basic stuff about not lying or stealing, being good to the poor, etc. I expected something racier from a pagan religion. There were tourists around, but they didn't get out much at night. I didn't find that many English speakers among tourists or locals. Night life was fairly quiet while university was on break. 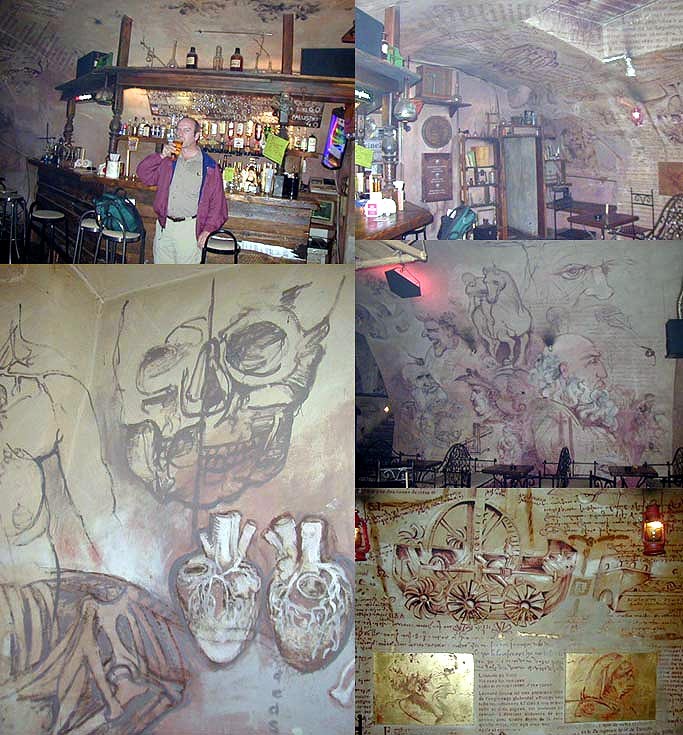 Too bad, there are lots of really cool basement pubs all over Krakow. It was fun drinking in these 800 year old cellars with arched ceilings and strange decor. The only one I went into with my camera was Pub Atmosphera with a Leonardo da Vinci motif. It was a slow night so I B.S. 'd with the bartender, took some pictures and asked him to take one also. I'd like to go back in the spring some time when the university is still in session and see if the pubs are more lively. 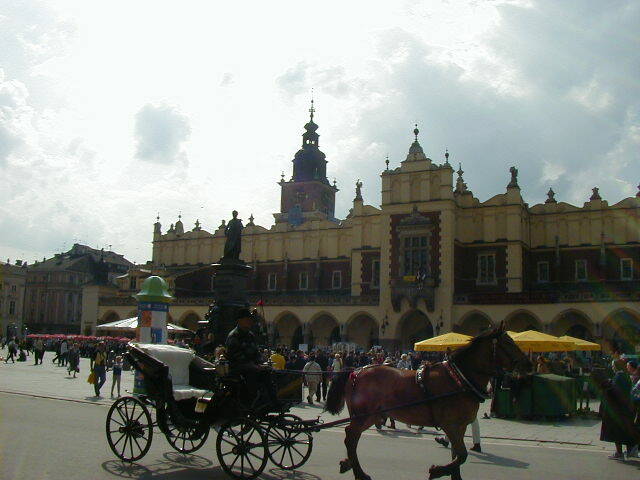 In the center of Old Town is Main Market Square. This is the biggest square I saw in Europe and second only to Prague's Old Town Square in beauty. 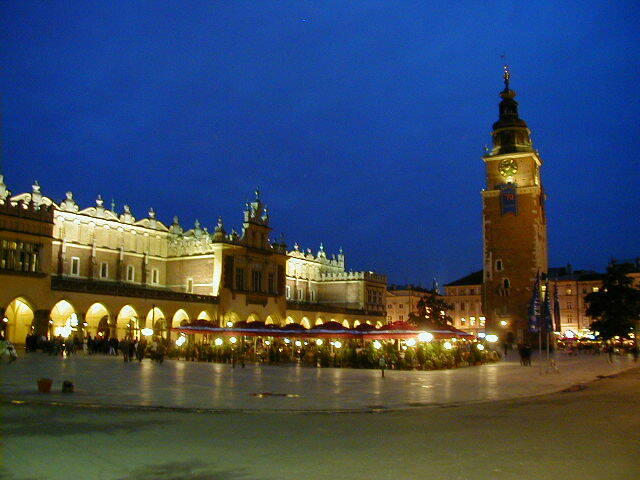 In the center is the Cloth Hall, now full of tourist shops, and the fifteenth century Town Hall Tower. The rest of the Town Hall was dismantled in the eighteenth century. 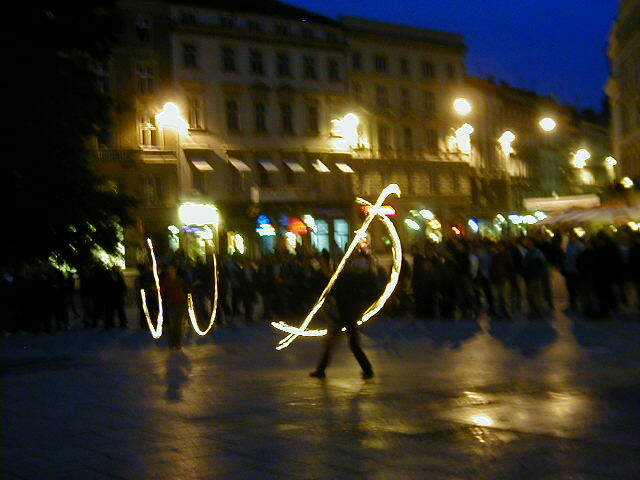 The square has street performers day and night. There were street musicians unlike street musicians in other parts of Europe, the musicians in Krakow were really good. They were serious performers with lots of training. 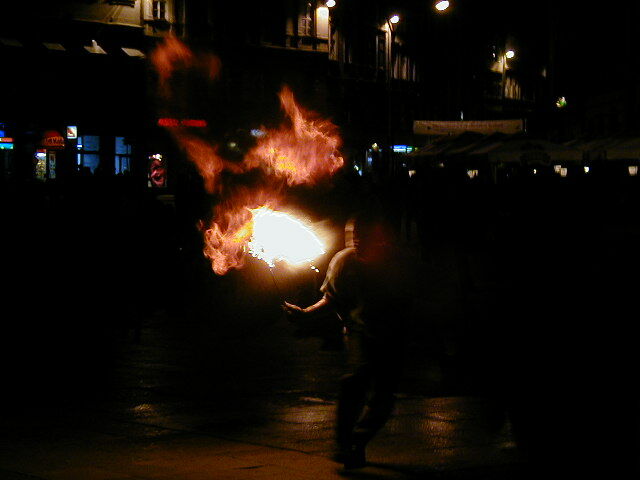 But the acts that photograph best were the ones involving fire, especially at night. OK, so my camera doesn't take great pictures at night. You can still get the idea. 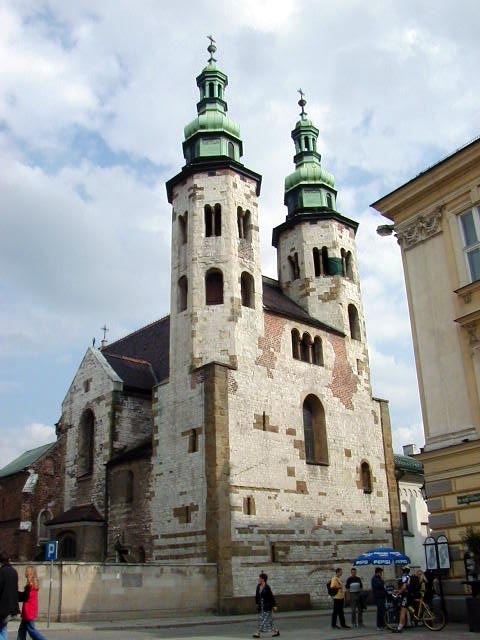 In one corner of the square is St Adalbert's Church, built in the tenth century. 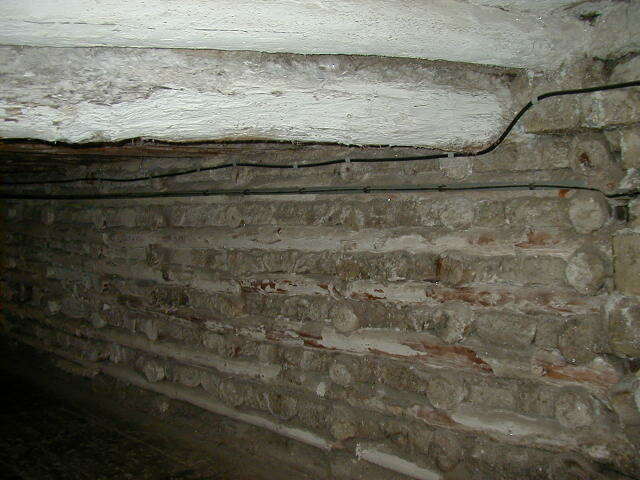 The original foundations are in the basement, along with some interesting artifacts. I can't read Polish, but I think the fellow in the glass topped box is St Adalbert. It's not very secure; I was down there alone and could have picked up a souvenir if I had wanted to. I didn't, I'm not that morbid. In another corner of the square is St Mary's Church. 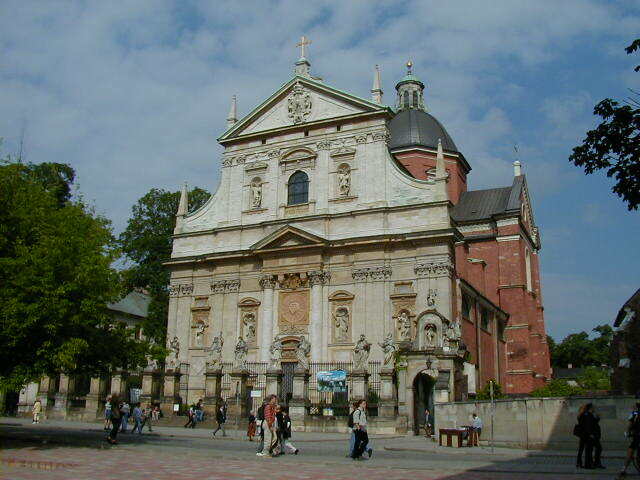 I guess every city in Poland has a St Mary's Church. The foundation of this St Mary's was laid in 1220, while the church was rebuilt and added onto until the eighteenth century. 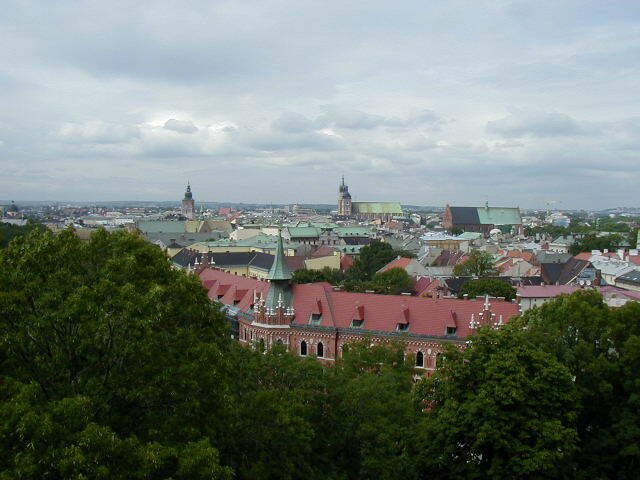 The shorter tower is the church's bell tower while the taller tower is the cities watch tower. Legend has it that a watchman spotted approaching Tartar invaders from this tower and sounded the alarm by playing his trumpet. Before he finished playing an arrow hit him in the throat and killed him. But his alarm was heard and the city woke up in time to defend itself. Now it has become a city tradition to play a hejnal, a simple trumpet tune, every hour on the hour, ending the tune abruptly in mid-note. 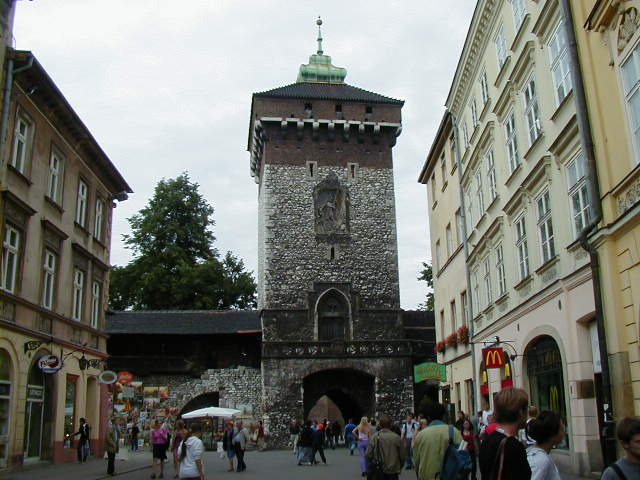 On the northeast side of Old Town is the Florian Gate, built around 1300, and in front of that is Krakow's Barbican, built in 1498 to defend the Florian Gate. South of the square, still in Old Town, is the sixteenth century Church of Saints Peter and Paul, and next to it the eleventh century St Andrew's Church. 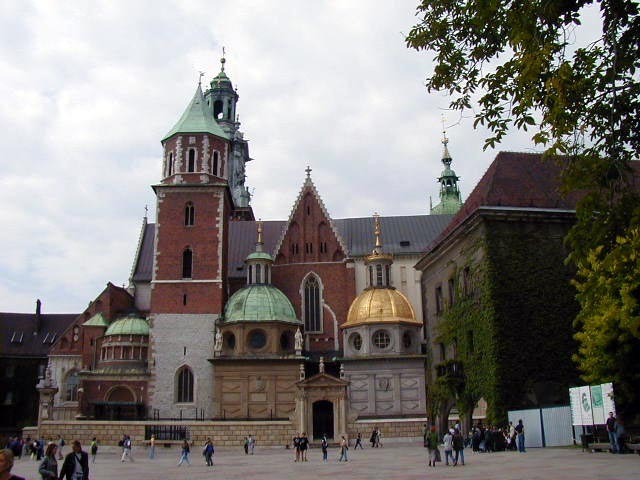 The south side of Old Town is at the foot of the hill that Wawel Castle and Cathedral sit on. 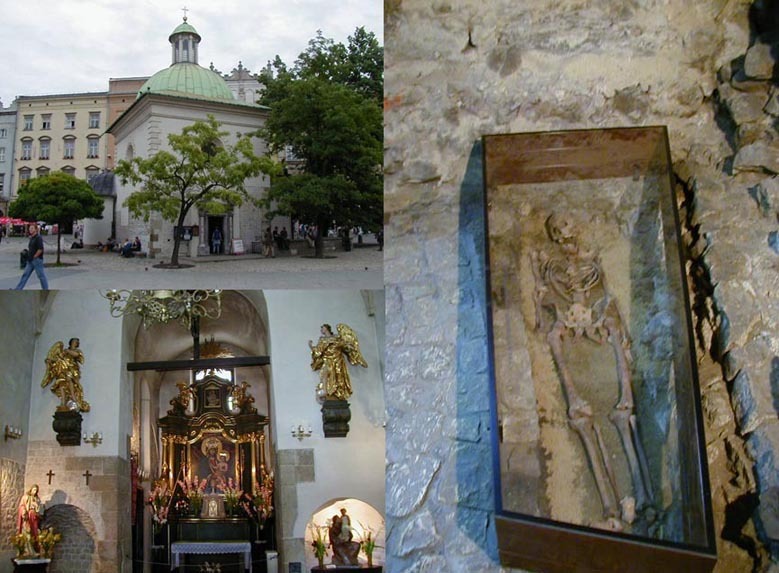 Inside the Cathedral are lots of shrines, altarpieces, sarcophagi, and Sigismund Bell, cast in 1520 and weighing eleven tons. I also got a nice view of Krakow from the Cathedrals tower. 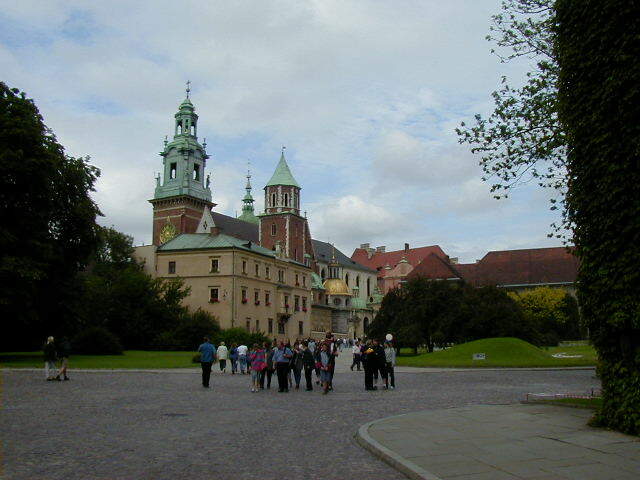 From the Wawel Castle grounds I went into the Dragon's Cave, former home of the legendary Wawel Dragon*. I went down a spiral staircase built into a dried up well that led into a cave under the castle. The cave was part natural and part excavated. 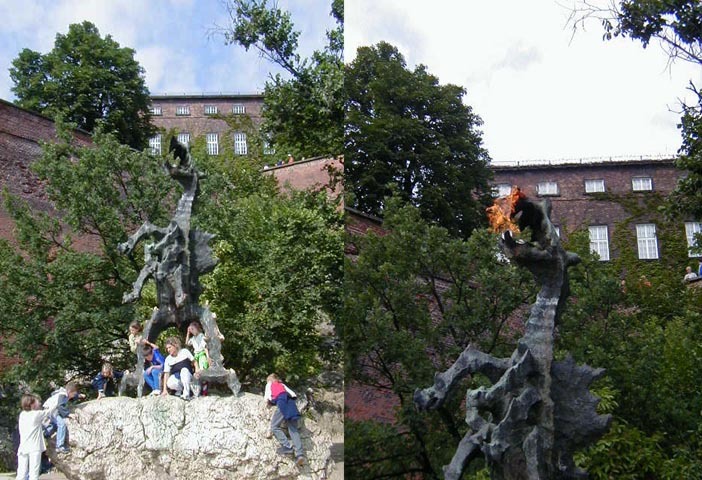 The cave leads out into the south side of Wawel Castle hill, where a dragon sculpture rigged to puff out flames amused the kids and me. 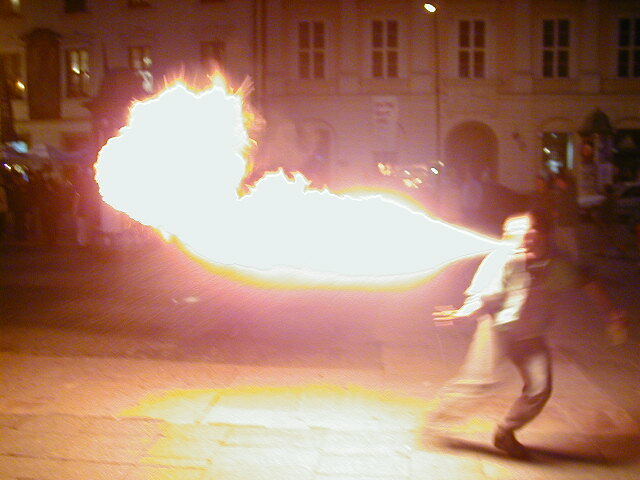 *Legend has it that long ago a dragon, which was an endangered species, lived under the Wawel Castle hill. Following his natural instincts, he consumed large quantities of sheep, cattle and virgins, who were obviously encroaching on his territory. The local ruler, Prince Krak, ignorant about the importance of bio-diversity, decided to kill the innocent dragon, rather than learn how co-exist with all of God's creatures. Against the protest of leading community vegans and other animal rights activists, he killed a sheep, filled its carcass with sulfur, set it on fire, and threw it in the dragon's lair. The poor dragon, unaware of the treachery of this evil prince, ate the sheep, went to the lake to try and ease his heartburn, and drank until he exploded. This totally upset the local ecology and the area was eventually overrun with virgins, demonstrating the folly of disturbing nature's balance. 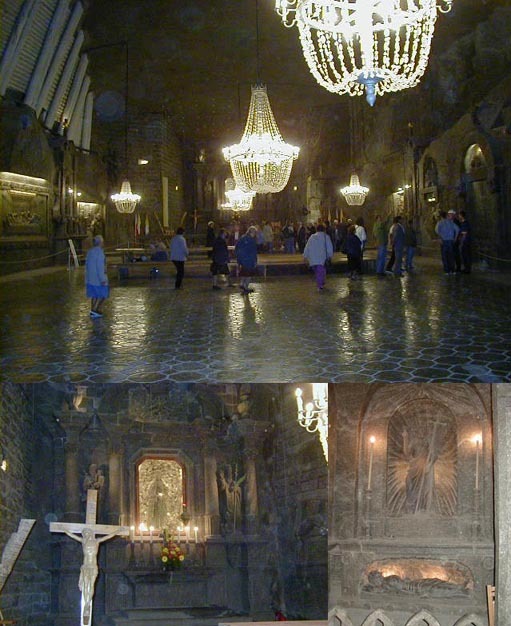 About ten miles from Krakow are the Wieliczka Salt Mines. 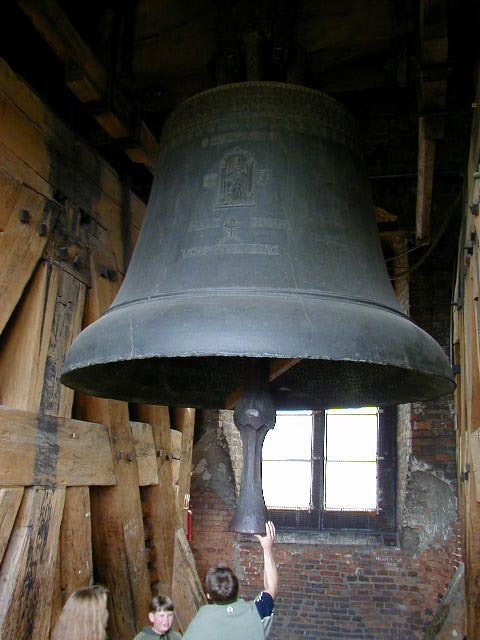 These have been in continuous operation for seven hundred years, and are kind of cool. I was impressed with what a great preservative salt was for MFEM supports. You enter by walking down a lot of stairs; I don't know how many, it took around twenty minutes. 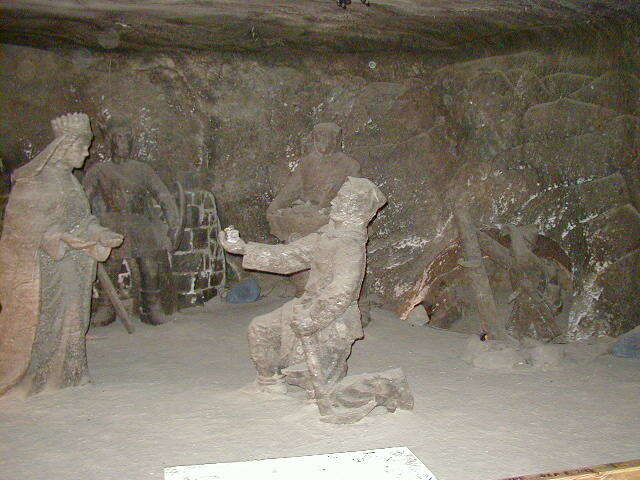 I was then led on a guided tour of caverns excavated over the centuries, many with statues carved by miners with spare time. The tour ends at a large underground chapel carved out of the salt. Everything there, including the chandeliers, are made of salt. Sometimes the cultural experience one is after in traveling requires some somber moments. I wasn't looking forward to my next stop, but felt it had to be visited. While in Krakow I made the short side trip to Auschwitz.